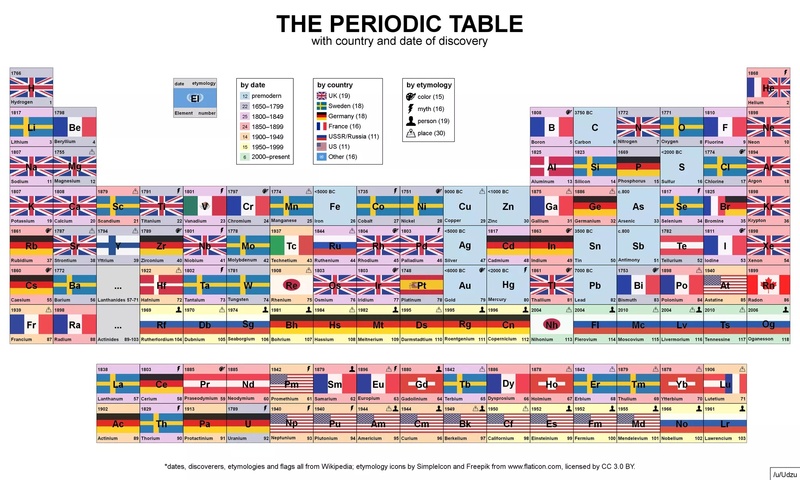 Below is an interesting way to present the Periodic Table of Elements (or, The Mendeleev’s Table). Each element is presented with the year and the flag of the country in which it was discovered (click to enlarge). It is interesting to see the “clusters” of discoveries by time and country… The clusters illustrate the intellectual history of countries particularly strong in fundamental science at specific periods of time. This entry was posted in Amazing technology, data, and people, Data Analysis and Visualization, Past, present, and future and tagged fundamental science, The Periodic Table of Elements. Bookmark the permalink.